The idea of making pottery got started in China and Japan about 14,000 BC. 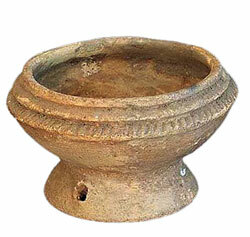 People probably used clay pots as a way of storing food or fermenting fish. Pottery-making slowly spread west to India, Iran, Mesopotamia, and then from there to Africa. 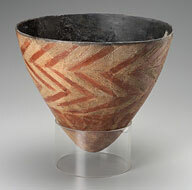 People in East Africa started to make clay pots about 6000 BC. From Sudan and Ethiopia to Egypt, African pottery styles are very similar. By 400 BC, pottery-making had spread as far west as West Africa. In West Africa, Nok and Yoruba potters made pottery. They were also using clay to make large clay sculptures. 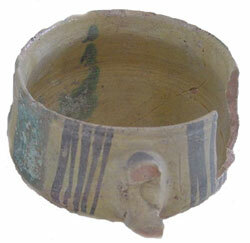 Around 75 AD, North African potters began to imitate imported Roman pottery. Soon they were exporting their imitation Roman pottery all over the Mediterranean, Europe, and West Asia. By about 100 AD, the African pottery had driven Roman pottery-makers out of business. So most of the clay plates and cups used in the whole Roman Empire were made in North Africa. Some African pottery even was exported to India and Iran, and north to northern Europe. About 200 AD, the Nok and Yoruba cultures in West Africa evolved into the Ife and Benin kingdoms. These kingdoms also produced their own distinctive pottery. Further south, in Congo, the Kisalian culture started to produce pottery about 900 AD. After the collapse of the Roman Empire, North African pottery factories kept right on making pottery. They still sold their pots all over the Mediterranean area. When they became part of the Islamic Empire in the late 600s AD, North African potters kept on working. Imitating Chinese pottery that came to Africa along the Silk Road, North African potters now colored their pots white with various colors. They made their colors with metal and glass glazes as we do today. But during the Middle Ages, North African factories slowly lost business to pottery producers in Iraq and Iran and China. Instead of selling pottery, now East Africans bought Chinese and Iranian pottery. Cite this page: Carr, K.E. Early African Pottery. Quatr.us Study Guides, May 19, 2017. Web. April 19, 2019.